When I sin that sin that I struggle with or when I don’t pray or read Scripture I have to make up for it by doing something, which is a lie from Satan. If you are a Christian I want you to understand that you are loved. His love for you is not based upon your performance. It’s based upon the perfect merit of Jesus Christ. You don’t have to move at all you are loved. You don’t have to be big. You don’t have to be the next John MacArthur. God loves you and don’t you ever forget that. Don’t you dare think for a second that you can love anyone more than God loves you. Marriage shows the relationship between Christ and the church. This verse shows how much God loves you. One look upward and you have the Lord hooked. He wants to be with you and when you enter into His presence His heart beats faster. Where does love come from? How are you able to love your mother, father, child, friends, etc. God’s love is so powerful that we are able to love others. Think about how parents see their newborn child and smile. Think about parents playing with their children and having a good time. Have you ever thought about where does that stuff come from? These things are here to be representations to show how much God loves and is joyful over His children. True love takes action. God poured out His awesome love for us on the cross. He crushed His Son so that you may live. When you allow your joy and peace to come from the perfect merit of Christ you will understand God’s love better. It is not dependent on what you do, what you are going to do, or what you have done. God’s love is greatly shown by what He has already done for you. True believers have the love of God in them. Pray for a greater understanding of the love of God. Sometimes it is so hard to grasp His love for us especially when we look into the mirror and see all of our failures. Without knowing how much God loves you, you are going to feel so miserable. I was praying one night and I was thinking to myself that God wants me to do more, no! The whole time that I was praying I didn’t understand that all God wanted for me was to just understand His great love for me. I don’t have to move a muscle I am loved. God is not mad at you. 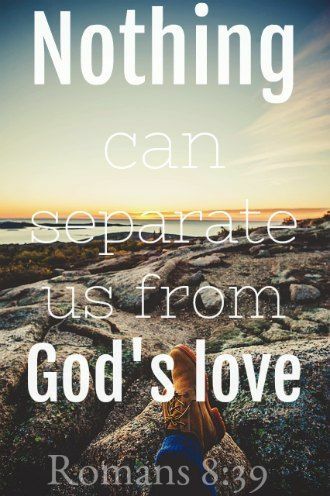 Whenever you think that you have done something to separate yourself from God’s love or it’s too late to get right with God or you need to be more to be loved of God remember that nothing can separate God’s love for you. Always remember that God’s love never ends. The love of God compels us to do His will. It is the love of God that drives me to keep fighting and obeying Him. It is the love of God that allows me to discipline myself and it gives me a desire to keep pushing when struggling with sin. The love of God transforms us. It was the love of God that drove Jesus to keep going in humiliation and pain. With every step and with every drop of blood the love of God drove Jesus to do the will of His Father. Discipline shows the great love that God has for His children. God’s love causes us to remain calm, stand strong, and never give up. 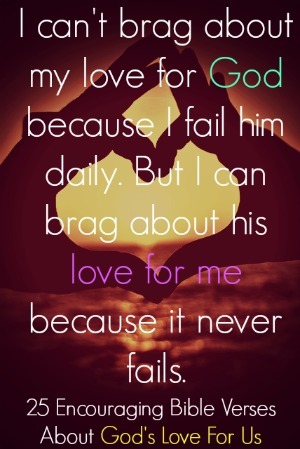 I can’t brag about my love for the Lord because I am so unworthy and I fall so short of His glory. One thing that I can brag about is that God loves me greatly and He is working in me daily to help me understand it more and more. If you are a believer write it down, put it on your wall, highlight it in your Bible, put it in your mind, put it in your heart, and don’t forget that God loves you. This study on the Love of God and quotes were very helpful, simple and easy to understand and follow. Thank you for giving me the opportunity to look and study from this sight. Our Sunday School lesson this week is on the Love of God.